Cardiff Beauty Blogger - Sindyydoll ♥ Makeup - Welsh beauty blogger - British Beauty Blogger: Smashbox Santigold The Santigolden Age Collection Overview with Makeup Look! Smashbox Santigold The Santigolden Age Collection Overview with Makeup Look! 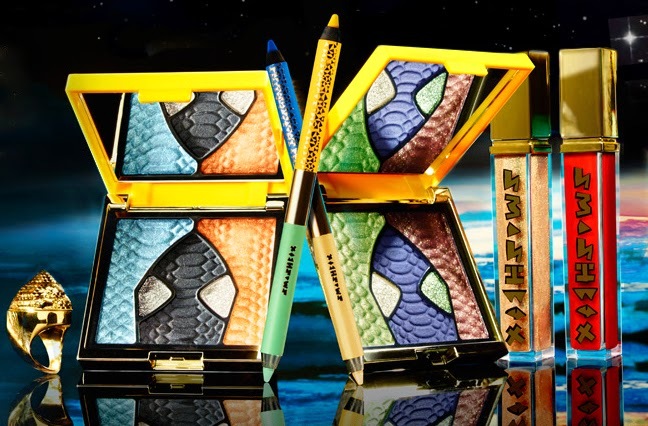 I thought I'd take the time to write a post about Smashbox amazing new collaboration with Santigold called The Santigolden Age Collection for Summer 2014. It is inspired by Santigold's love for the Mayan calender and bold bright colours. I was excited about this collection when it was first revealed and fell in love with the green pallet, Earth As We Know It from the word go, the pigments are creamy smooth and easy to blend, and easy to turn into a lovely natural summer look with a green pop of colour. Lipglosses are in the new Be Legendary formula, no more sticky lips with this ultra smooth lightweight texture and high shine, and they even have an amazing colour pay off and staying power. I'm not one for lipglosses but when these were released I have not stopped wearing them! For use in the water line and as a base for eyeshadows and more obviously to line the upper and lower lids the eyeliners are bold in colour, containing one gold colour teamed up with a blue, Azurite is never wrong / El Dorado and a cool toned minty green teamed with a bold yellow, Yellow Dwarf / Green Martian is a perfect way to add some colour to a look if you're just starting using eye makeup. Fool proof and easy to apply with it's creamy formula it can even be teamed up with the eyeliners! Do pop in to your local Smashbox counter to see this collection before it's gone! It's made with such artistic care and the pigments are amazing, it's great if you're starting off experimenting with eye makeup or a collector for Limited Edition makeup lines. I work at the Cardiff Boots Queen Street branch so do come in for a demo of these fantastic products. Here's my look using the Lipgloss, Hot Lava, mixed with the lipstick from the Ring, Still Kickin, Earth As We Know it Pallet on the eyes. Other makeup seen; 24 HR Eyeshadow Primer, Studio Skin in 1.2, Brow Tech Trio in Dark Brown, Radiance Blush Rush, Onyx Eyeliner, and a Full Exposure mascara. Views on this collection are my own and not those of Smashbox Cosmetics. This is not a sponsored post.